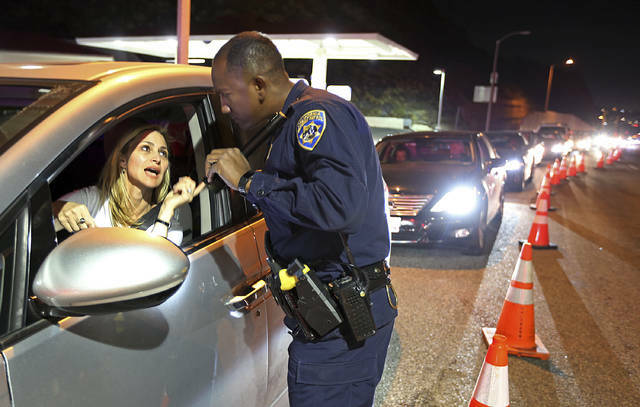 MALIBU, Calif. (AP) — Thousands of people have returned to neighborhoods evacuated during Southern California’s deadly wildfire but officials said the threat is far from over. The huge blaze briefly gained renewed life Tuesday with a flare-up in the Santa Monica Mountains before water- and fire retardant-dropping aircraft beat it back. However, except for an apartment building that burned in coastal Malibu, there was little sign of fire activity elsewhere in the vast burn zone west of Los Angeles. The weeklong blaze in Ventura and Los Angeles counties had blackened an area about the size of Denver and was 40 percent contained. Since last Thursday, the blaze had marched steadily toward the sea, engulfing mobile homes, scenic canyon getaways and celebrity estates. Firefighters could make more progress if relentless Santa Ana winds start to diminish as predicted Wednesday and Thursday. Authorities allowed residents back into several communities on Tuesday, including a section of Malibu. Other areas have been repopulated since the weekend. Tens of thousands of people remained under evacuation orders, down from a high of as many as 250,000. “We are not out of the woods yet. We still have some incredibly tough conditions ahead of us,” Ventura County Fire Chief Mark Lorenzen said. 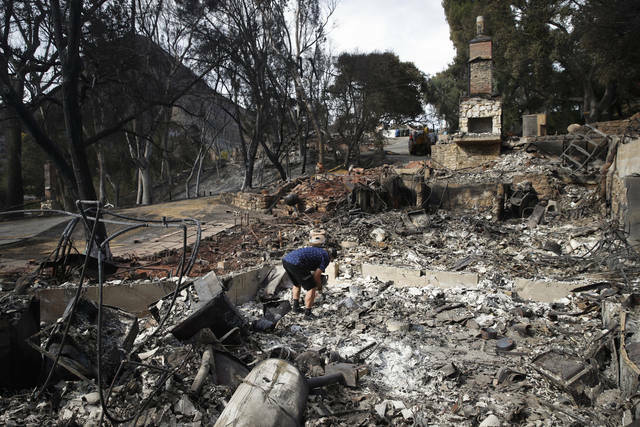 The number of homes and other structures destroyed had reached 435 but that number was sure to rise, warned Los Angeles County Fire Chief Daryl Osby. Damage assessments were continuing, with crews having to gain access to canyon areas on foot. “It’s pretty cool. It’s really amazing that people out there know that we’re kind of stranded here in Malibu,” Cherie Millford Smart said. The fire had burned near 152 square miles (393 square kilometers) of brush and timber, destroying more than 80 percent of National Parks Service land in the Santa Monica Mountains National Recreation Area. The area has not seen such a destructive blaze since 1993. The blaze has left an array of hazards, including trees ready to fall, downed power lines, toxins, water main and gas leaks. A forecast of possible rain next week would help firefighters but also raised the prospect of potential mud flows, Osby said. 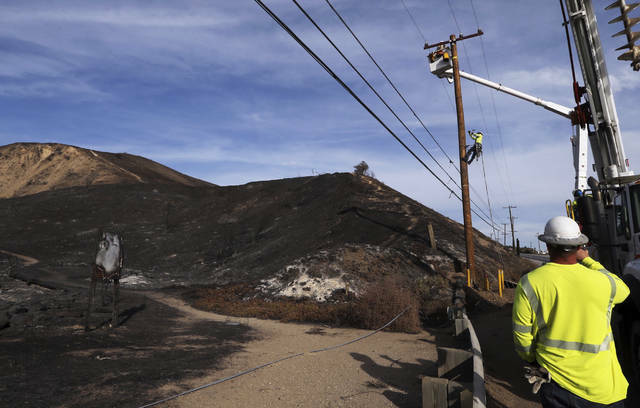 Southern California Edison said last week that it reported to the California Public Utilities Commission “out of an abundance of caution” that there was an outage on an electrical circuit near where the fire started Thursday but there was no indication its equipment was involved in the fire reported two minutes after the outage. A lawsuit was filed Tuesday over a wildfire in Northern California, where at least 48 people were confirmed dead in the Camp Fire that obliterated the town of Paradise. The suit on behalf of some victims accuses Pacific Gas & Electric Co. of causing the massive blaze. A landowner near where the fire began said PG&E notified her the day before the wildfire that crews needed to come onto her property because some wires were sparking. Myers reported from Thousand Oaks. Associated Press writers John Antczak and Christopher Weber contributed from Los Angeles. Nathan T. Reem receives funding from the National Science Foundation. Esperanza Shenstone receives funding from The Triad Foundation. Shopping in your supermarket’s produce section is like strolling through a museum of humanity’s greatest inventions. Perfect ears of golden sweet corn; tomatoes of different sizes, shapes and colors; and spicy jalapeño peppers are all a testament to human ingenuity. You may not consider food an invention, but nearly all foods we eat are the product of thousands of years of constant breeding and selection. In the distant past, when our ancestors transitioned from hunter-gatherers to an agrarian lifestyle, they began domesticating plants by breeding them for characteristics they found desirable – bigger, tastier fruits and more compact growth. The wild ancestors of domesticated crops looked much different than the foods we eat today: They had smaller, sometimes inedible fruits; the plants grew in a sprawling growth pattern; and they scattered their seeds or dropped their fruit to the ground in order to ensure the survival of their species. To put it bluntly, you wouldn’t want these wild plants in your garden, or on your dinner plate. The process of domestication resulted in the crops people grow and eat today, but it is a time- and labor-intensive process. Our lab, led by Joyce Van Eck, wanted to accelerate the domestication of the groundcherry, a semi-domesticated orphan crop, using modern gene editing techniques. Orphan crops do not grow well in large-scale agricultural production because they possess many undesirable characteristics such as sprawling growth and fruit drop. We chose to work on groundcherry because it is a relative of domesticated tomato. We know a lot about tomato genetics and are able to compare a particular gene in domesticated tomato with its counterpart in the wild groundcherry to determine what edits need to be made. We have also crowdsourced local growers and farmers to learn which traits needed improvement and which ones were most valuable for agricultural production. Using this critical information gleaned from growers, we then used gene editing technology known as CRISPR/Cas9 to improve groundcherries. Although you likely won’t find them in your grocery store, you may have seen groundcherries for sale at your local farmer’s market. The groundcherry is a wild relative of the tomatillo and, much like the tomatillo, its fruits are encased within a papery husk that protects the fruit from spoiling. The berry inside the husk is small – marble-sized – but delivers a big citrusy flavor. A source of antioxidants, vitamins A, B and C, and other nutrients, these small berries are exclusively grown in small-scale farms and home gardens. Based on the groundcherry’s wild growth habit and small size of fruit, we identified it as an underutilized crop. Our current research has been focused on how to incorporate groundcherry into the current food system. Commercial production of the groundcherry (Physalis pruinosa) is virtually nonexistent, a void that can at least partially be attributed to the plant’s unruly growth. With its long sprawling branches, the groundcherry requires extensive management to tame its growth. Its branches are adorned with husk-covered fruits that fall to the ground, often before ripening. This makes harvesting the fruits a labor-intensive process, and raises food safety concerns if the fruits come in contact with soil microorganisms that can cause food-borne illnesses. A critical element of our groundcherry improvement project was crowdsourcing the wisdom of New York state citizen scientists and farmers to identify groundcherry characteristics or traits that needed improvement. Volunteer home-gardeners and farmers across different USDA hardiness zones collaborated with us by growing several groundcherry varieties and provided feedback on characteristics such as flowering time, fruit size, flavor and fruit drop. We used this critical feedback for improve this fruit. To improve traits in crops, plant breeders have largely relied on the natural mutations that occur in all living organisms. These natural mutation events change gene sequences and thus modify traits, but they are rare. Before gene editing, there were few tools to speed the breeding process. One of these, called ethyl methanesulfonate (EMS), is a powerful carcinogen and used to randomly mutate DNA of thousands of plants. The downside is that all of the mutated plants must be carefully assessed to select those with mutations in the genes breeders wished to modify. This process, still in use today, is messy and time-consuming; there is no way to control which genes are, or aren’t, mutated, and screening thousands of plants can take time. CRISPR/Cas9 is a powerful gene editing tool that can be used to cause mutations in DNA more precisely than the EMS-induced random mutations. Rather than waiting for random mutations or evaluating thousands of mutagenized plants, CRISPR/Cas9 can accelerate breeding and domestication of crops with greater specificity than any other technology. Fortunately, many of the traits associated with domestication, including fruit size and growth habit, are the result of natural mutations and rearrangements of DNA that ultimately change the function of the genes controlling these traits. CRISPR/Cas9 allows us to copy these mutations from the tomato and replicate them in the groundcherry. Along with our collaborator Zach Lippman at Cold Spring Harbor Laboratory, we recently published our first attempts at accelerating domestication of groundcherry in the journal Nature Plants. Our first priority was to tame the wild growth. In tomato, a natural mutation in the SELF PRUNING (SP) gene, which represses flowering, results in plants that have more manageable growth. We hoped to see the same response when we “CRISPR’ed” groundcherries, and found that the plants with mutated SP grew with a much more compact structure. Specifically, the branches of these plants were much shorter than their unedited counterparts. This more diminutive growth habit is preferable for larger-scale agricultural settings, because more compact plants can be grown and harvested more easily. We targeted one more well-studied gene in groundcherry, called CLAVATA1 (CLV1), which directly controls fruit size. In tomato, mutations in CLV1 result in larger fruits. Because groundcherry fruits are rather small, we tried to increase fruit size by mutating CLV1 with CRISPR/Cas9. At first glance, groundcherry plants with mutated CLV1 looked the same as their unedited counterparts. However, fruits from CLV1-mutant plants were larger, weighing 20 percent more after mutating this single gene. CLV1 is just one of many genes controlling fruit size. We expect that mutating more of these genes will enable us to create larger fruit in a short time. The process of CRISPR’ing a plant gene, such as CLV1 and SP, takes only about a year, whereas traditional breeding usually requires much more time and effort to achieve the same result. In order to fully domesticate and improve groundcherry, we plan to study more genes associated with characteristics that would make it more attractive crops for farmers to grow and consumers to purchase. Currently, we are focusing on genes that have the potential to correct fruit drop, influence fruit flavor and nutrition, and increase fruit size further. Ultimately, we envision creating a more compact groundcherry plant with larger, more nutrient-laden fruits that remain on the plant. To do so, CRISPR/Cas9 mutations of all the genes controlling these traits will be combined into a single plant to create a fully domesticated groundcherry worthy of growing in farmers’ fields and stocking grocery store shelves. Importantly, the groundcherry isn’t the only wild plant that can be domesticated. CRISPR/Cas9 can be applied to virtually any plant species, so in the future more wild species may be domesticated much the same way we have achieved here. So, the next time you go shopping for groceries, pay attention to the produce aisle. Appreciate the efforts of our ancestors that took thousands of years to invent the foods we know today, and think how gene editing will help achieve this in a fraction of the time. If god didn’t want us to engineer domesticated organisms, he wouldn’t have given us genes, CRISPR and related facilities. If he hadn’t wanted us to see what really irresponsible fools look like, he would never have given us the Rifkins and Proxmires, not to mention certain bleached and dyed politicians with comb-overs. I say Go for it! and more strength to you and your work. Any god opposed to your success but powerless to prevent it is unworthy of our respect. And if he is in favour of it, it would be blasphemy to desist.